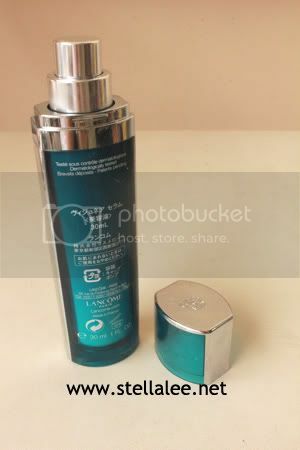 Given a chance to try this first by Lancome Indonesia before it enters the market, using it for 4 weeks, both day and night, I am prepared to give a full review. 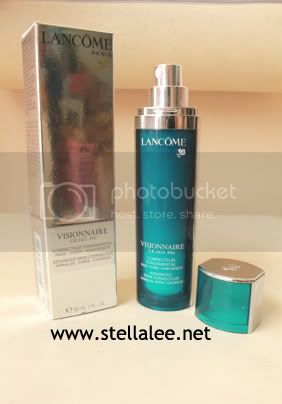 Will Lancome impress me again like usual or not? An antiaging skin corrector for more beautiful skin. More than a wrinkle-corrector, this product is capable of fundamentally re-creating more beautiful skin. The first skincare product with LR 2412, a molecule designed to propel through skin layers, it triggers a cascading series of micro-transformations along its path. On the surface, wrinkles and pores are visibly corrected. Imperfections like signs of UV damage and acne marks appear diminished. . This product is non-comedogenic, non-acnegenic, and dermatologist-tested for safety. See the super short pump there? So I have to take the product, and lean it to 45 degree to make it come out nicely. Left over product is such a waste, especially because the product is expensive. I wish they would improve the pump length a little. Although it sounds promising all the way, unfortunately I feel no need to continue using the product. walaupun tertarik dengan "menyamarkan pori2" *which is my biggest problem*, tapi pass dengan dengan harga segitu ._. hello greetings from spain.I love your blog! The problem what I have with my skin are open pores. I am 19 haha.. If you have open pores, try to close it by using mud mask at least once a week [after exfoliation is better] ^_^ <3 hope it helps!